Casella, one of the UK’s leading providers of occupational hygiene and environmental monitoring solutions, showcases its comprehensive range of personal and environment monitoring solutions on stand K40 at The Health & Safety Event, NEC Birmingham, 9– 11th April 2019. Casella is dedicated to reducing occupational health and environmental risk through its hand-held devices for walkthrough surveys and bodily worn solutions for precise personal sampling. At the event, Casella will be exhibiting its new software solution for the first time, NoiseSafe, which can be used in conjunction with its personal noise monitoring dosimeter, the ever popular dBadge2. NoiseSafe software saves the user time with its instantaneous reporting on an employee’s noise exposure levels. The software downloads a typical eight-hour workplace recording in just a few seconds, and easy analysis of the results allows for compliance to legislation. NoiseSafe software is free and available with each Casella noise dosimeter purchase, available from April 2019. On the stand this year, Casella will showcasing its full range of occupational instruments, including entry and more advanced sound level meters with environmental noise parameters. Casella will demonstrate a number of its real-time hand-held solutions, including its range of Sound Level Meters and the Microdust Pro, ideal for walkthrough surveys to identify problem areas. Used for short-term measurement, these rugged instruments are ergonomically designed and user friendly to provide quick, accurate and instant data. Casella will also be exhibiting its range of personal monitoring solutions, including the Apex2 personal air sampling pump monitor designed to monitor for harmful exposure dust, fumes and gases. The Apex2 is intrinsically safe, has outstanding back pressure capability and the power to handle any personal monitoring regime. Casella’s hand arm vibration meter, the HAVex, specifically designed for Hand Arm Vibration Exposure Measurements will also be on stand for visitors to view. The HAVex is an easy to use meter that measures the levels of vibration transmitted to the hand from power tools, vehicles, machine controls and other vibration sources. For the latest news and updates on its products, visit stand K40 at The Health & Safety Event, NEC Birmingham or visit www.casellasolutions.com or follow @CasellaHQ on Twitter or @Casella on LinkedIn. Casella, air sampling, noise and vibration specialist, has launched an advanced and reliable software package for its personal dosimeter (the dBadge2), NoiseSafe. 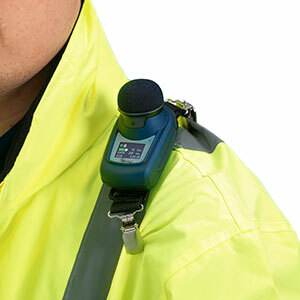 When used alongside Casella’s dBadge2, it is the ideal tool for fast and efficient reporting and analysis of noise exposure levels. In the UK, over one million employees are exposed to levels of noise at work, which puts them at risk of noise induced hearing loss (NIHL). In fact, last year 23,000 workers in the UK reported work-related hearing problems, with workers in the manufacturing, food and construction sectors most at risk due to noisy working conditions. Casella’s NoiseSafe software saves the user time with its instantaneous reporting on an employee’s noise exposure levels. Linked to the dBadge2, the software downloads a typical eight-hour workplace recording in just a few seconds. Audio and motion can be analysed to determine if any of the data is erroneous, which can be quickly and easily removed from exposure data, giving confidence in the results. Casella’s NoiseSafe software is available with any purchase of the dBadge2 from April 2019. Casella is dedicated to reducing occupational health and environmental risks and supporting businesses with their monitoring and analysis needs. For more information about Casella’s advanced NoiseSafe software visit, www.casellasolutions.com or follow @CasellaHQ on Twitter or @Casella on LinkedIn. 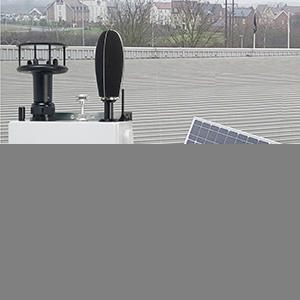 Casella, leading provider of noise and air sampling monitoring, showcases comprehensive range of monitoring solutions for both individuals and the environment at Health & Safety North, Manchester 9-10 October 2018. On display at stand G60 will include the Apex2 personal sampling pump range, the dBadge2 personal noise dosimeter and many more. Casella is dedicated to reducing occupational health and environmental impact risks through its hand-held devices for walk-through surveys and bodily worn solutions for precise personal sampling. The Apex2 is a range of Intrinsically Safe (IECEx) bodily worn pumps used to sample for airborne contaminants, designed specifically for use in potentially explosive areas in the oil and gas, petrochemical, pharmaceutical and mining industry. The Apex2 is compatible with Casella’s Airwave App, available for download on both Android and iOS devices. The Airwave App enables users to remotely start, pause or stop a measurement run, monitor battery life and memory capacity and check measurement progress direct from a mobile device, minimising disruption to the worker. The Flow Detective™ is an electronic flow meter calibrator, designed to measure the flow of air sampling pumps to within 2% accuracy. Additionally, the Flow Detective™ is the first calibrator on the market with the ability to measure pulsation, indicating if the air flow pulsation exceeds 10%. Air sampling pumps must have a pulsation level less than 10% if they are to adhere to ISO 13137. The Flow Detective can be used with any manufacturers’ air sampling pumps, though, when used with Casella’s Apex2 personal dust sampling pump, the Apex2 and Flow Detective can be connected via the Airwave App allowing for closed loop airflow calibration with the ability to remotely set the flow via Airwave. Exposure to high noise levels can cause permanent, irreversible hearing damage, however, there are a number of practical ways of preventing and protecting workers against the risks at work. 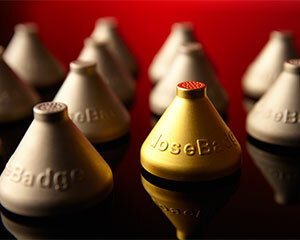 The dBadge2 is the next generation in personal noise dosimeters, ideal for a variety of workplace noise assessments. Intrinsically Safe versions of the dBadge2 are available, making it the perfect tool for personal noise assessment for any industry or environment. The dBadge2 is also compatible with the Airwave App, allowing for remote access making monitoring and easier collection of data. For more information, click here. Follow Casella on Twitter @CasellaUK, LinkedIn or on Facebook. Noise monitoring experts Cirrus Research have launched a free Noise at Work assessment to help companies provide a risk-free environment to protect their workers’ hearing. The first of its kind, the comprehensive assessment is available UK-wide and follows a four-stage process that enables companies to identify, target and eliminate noise risks in the workplace. Initial site assessment – including a tour of your premises with you to identify potential noise risks in your workplace. A review of existing methods – to look at any existing control methods in place and analyse their efficacy. 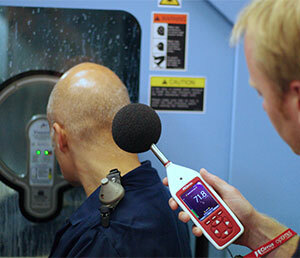 Test measurements – using Cirrus’ industry-leading noise measurement equipment to take sample readings. Expert recommendations – offering the best solutions to move forward, from instrumentation and training to full analytical services. “We believe in protecting people from hearing loss and other health conditions associated with excessive noise exposure,” said Group Marketing Manager, Tom Shelton. “The new noise assessment is part of our wider UK campaign ‘Noise Changes Lives’ that highlights the risks and impact that hearing loss can have on individuals. Follow Cirrus Research on Twitter @cirrusresearch to keep up-to-date or visit www.cirrusresearch.comto find out more information. Founded in 1970, Cirrus Research plc is a leading specialist in the development and production of noise measurement instruments. Its latest scientific and technological developments are utilised to produce noise measurement instrumentation equipment to accurately measure noise and its impact. As an industry leader, all its products are manufactured in the UK and are used in a wide range of different applications within the construction, transport, aviation, manufacturing, and the leisure and sport sectors. Cirrus is part of the British Safety Industry Federation’s Registered Safety Supplier Scheme, identifying its organisation and products as ‘genuine and safe’, assuring customers that the products supplied are genuine, properly tested and certified. Cirrus Research is an ISO 9001:2008 and ISO 14001:2004 Registered Company. Protecting your workers from occupational noise just got easier and cheaper thanks to a new deal being offered on the Cirrus Research doseBadge. Cirrus Research has been protecting workers’ hearing for nearly 50 years but it helped to revolutionise the sector 20 years ago when it introduced the first wireless personal noise dosimeter badge to the UK market. Not only did its first doseBadge make the process of monitoring workers’ exposure to noise far simpler, it made it much more cost-effective at the same time. The doseBadge still is the only noise dosimeter without buttons or a display, meaning that its readings are more accurate than other instruments as the data recorded can’t be tampered with. Comprising of a single compact unit, the doseBadge weighs in at a mere 0.051 kg (1.8oz) and is made from robust materials, making it the perfect instrument to measure the personal noise exposure of workers and employees across all industries, in all types of locations. Follow Cirrus Research on Twitter @cirrusresearch to keep up-to-date or visit www.cirrusresearch.com to find out more information. The collective movement for solving issues surrounding work related ill health continues to gain momentum, highlighted in the HSE Help GB Work Well Scheme calling for “greater awareness of the harm, costs and preventability of the issue” which should “drive collective action to improve health outcomes”. In an effort to raise awareness of dangerous substances in the workplace, the European Agency for Safety and Health at Work (EU-OHSA) has recently launched a ‘Healthy Workplaces Manage Dangerous Substances campaign’ to promote a culture of risk prevention. The campaign is intended to heighten awareness of risks linked to exposure, targeting workers with specific needs. Each year, there are 12,000 lung disease deaths estimated to be linked to previous exposures at work. A 2017 HSE report highlighted 18,000 annual incidences of self-reported work-related breathing or lung problems in the previous 3-year period up from the 10,000 per year actually estimated. Although Health and Safety Executive (HSE) statistics show that work related deafness incidents have generally gone down since 2008, 20,000 people a year still suffer with work-related hearing problems. BAM Ritchies prides itself on being one of the first geotechnical contactors to carry out extensive hygiene monitoring of its workplaces. The company is a division of BAM Nuttall, a £60 million business with 400 employees throughout the UK providing ground engineering services for government, local authority, utilities and public/private companies. Mark Sherwood has been an occupational hygienist at the company for 3 years, responsible for dust, noise fumes and vibration monitoring nationally for BAM Ritchies as well as supporting BAM Nuttall. A typical day includes a range of dust assessments, from wood, welding fumes, quarry dust, and respirable crystalline silica. He undertakes personal exposure monitoring across the workforce to control exposure levels and where necessary, provides recommendations with preventative health measures to control any hazards from dust, noise and vibration. Options such as elimination, substitution and engineering controls are explored, or PPE/RPE is recommended from the accurate exposure measurements. When Mark first started as an occupational hygienist, the workers were curious, asking questions about the equipment, and the reason for it being used. Individuals were interested to learn the results from the monitoring equipment and what the data meant. To ensure Mark was able to establish accurate measurements for dust, noise and vibration exposure, working closely with regulatory limits, he used Casella’s equipment, and still does today. To adhere to compliance with EH40 2005 workplace exposure limits (WELS) Mark uses 8 Casella lightweight, rugged bodily worn Apex2 personal air sampling pumps to monitor contaminants that may pose a health risk, including hazardous dusts like silica in quarrying or fumes during welding or dust created during evacuation. Noise exposure is measured with the 620 Sound Level Meter and a Noise kit which includes 6 dBadge2 dosimeters for noise at work applications, recording the audio of noisy operations, storing noise dose and performing octave band analysis, as well as general environmental measurement. This ensures regulatory compliance and encourages improvement initiatives to protect worker hearing. This thorough method ensures exposure levels are assessed with the wireless capability via Casella’s Airwave app meaning monitoring does not need to disturb worker operations and data can be transmitted for assessment and alerting purposes direct to inboxes of nominated personnel. BAM Ritchies prioritises protecting their people. Mark had previously used Casella’s HAVex meter to measure the vibration levels of the tools employers were using to ensure they weren’t over exposed to hand arm vibration during their daily routine. However, a proactive initiative by senior management has since removed vibration tools and the need for monitoring. In the event of there being no alternative method, a request to use a vibration tool requires a Permit to Work system authorised by the appropriate/nominated person. There are instances where Casella’s noise and dust monitoring equipment has resulted in positive changes across sites around the country. This has included an additional dust extraction system at a material testing laboratory in Scotland to further eliminate risk of substance exposure. Results from noise monitoring at quarries fortified the introduction of filter 3 hearing protection to ensure workers have the upmost protection, as a precautionary method rather than an essential one. Other sites have also decided to upgrade RPE with the same sentiment of protecting workers as much as possible with the current and future exposure levels being carefully considered. The very nature of how Mark’s role is perceived by staff has also completely shifted. Now, individuals instantly understand the value behind what Mark is doing, knowing how the equipment works and the role it plays in protecting them from potential hazards. “I make it a priority to understand different working patterns and movements in a working day so that my role can slot neatly into this. Workers appreciate this as it’s clear their time and tasks are being valued”. 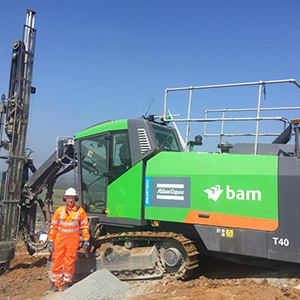 Bam Ritchies prides itself on being a company that achieves extraordinary things, pushing boundaries and providing ground engineering solutions that bring engineering to life. Without a healthy workforce this vision cannot be realised. “Casella site monitoring equipment is a crucial part of my everyday kit that I carry everywhere, without fail” said Mark. The company is an industry leader for its effort to monitor and protect its workforce, and this process has now come full circle, with the workers completely in tune with the benefits and process, collectively working towards a healthy working environment. Casella is dedicated to reducing occupational health and environmental impact risks through effective monitoring solutions. Casella prides itself on providing precision instrumentation since 1799, supplying eminent figures including David Livingstone and Charles Darwin with instrumentation for their exploration and scientific work. Casella has changed significantly over these 200 plus years but remains perfectly placed to offer reliable, trust worthy and credible solutions for Occupational and Environmental monitoring of noise and dust, with over 40 years of innovation in noise and 60 years in dust measurement. Casella’s aim is to enhance the long-term health and quality of life for workers in high risk occupational sectors and to monitor the impact on the environment through innovative technology, easy to use products and expertise that can be trusted. Offices in China, India, Australia and the USA, as well as a host of global distributors, provide both service and support to those searching out solutions for risk reductions. Through the web-based Casella 24/7 interface, the Guardian2 solution allows users to undertake PM10 monitoring and create automated reports/alerts in real-time direct to multiple users PC or mobile devices. The Guardian2 ensures data integrity, wherever in the world the system is located. The system is easy to install and once connected, all sensors within the Guardian2 are activated and data is automatically transmitted. The comprehensive reports assist in planning controls for noise and dust on construction sites, to improving environmental performance and helping reduce downtime from exceeding permitted limits. Yorkshire-based noise monitoring specialists Cirrus Research have appointed Martin Ellison as its new Sales Manager, following a re-alignment across the company’s senior management team. Martin, 55, has more than 15 year’s direct sales experience having worked in several sectors including the automotive, manufacturing, construction and engineering acoustic industries. Originally from Manchester, Martin will be based at the company’s headquarters in Hunmanby, North Yorkshire, leading a team of 10 across national and global territories. 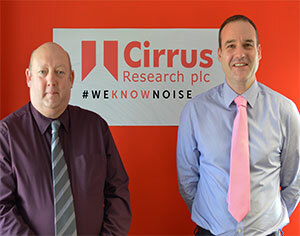 Noise Monitoring specialists Cirrus Research have expanded their training academy programme, adding a new Noise at Work Awareness course. Aimed at Health & Safety personnel who require a basic understanding of the noise regulations, it is also suitable for those who are new to noise assessments as well as a useful revision for people who have not been involved in this area for some time. The course covers general health and workplace safety, the risks posed by noise to hearing. It also looks at the duties and responsibilities outlined in the Control of Noise at Work Regulations (2005) – both employers and employees. To ensure a rounded training experience, there is also a practical session on noise measurement and control, coupled with a hands-on element where actual measurement are taken and analysed by the delegates. Noise Theory – What is Sound? What are the dangers of Noise? How Noise is measured – What terminology is used? 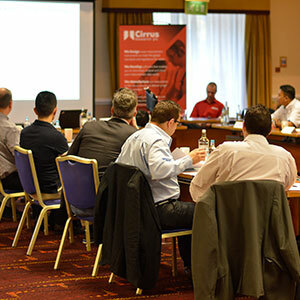 All Cirrus courses offer a bonus of benefits starting with the detailed knowledge and experience gained from the course’s industry leaders; the chance to gain valuable CPD points, as well as enjoy a great networking event at the same time.